Marinating and grilling chicken adds flavor in an easy way. Paired with colorful peppers and kale, roasted in garlic and olive oil, completes the dish with a minimum of work. Perfect for outdoor meals, entertaining guests or just to make the family happy with a tasty meal. Grilled steaks with baked potatoes are a classic. Perfect for outdoor and indoor events. Serving it with tomato chutney takes the flavor to another level. Make extra and use the chutney as a condiment for snacks and toast. It stores in the refrigerator for two weeks. Sorbets are traditionally served between courses during a meal to cleanse the palette. The clean, refreshing taste of this sorbet is perfect in this role. It also make a great treat after a meal or as a snack. Serving an original appetizer to impress guests is always a challenge. This is one appetizer that is simple to make and full of flavour. For a vegetarian version, eliminate the crab. The roasted red peppers, dill and lemon juice add plenty of flavor all on their own. Salads are one of the best ways to load up on fresh vegetables. This salad is a great example. The extra flavor from the roasted red pepper in the dressing gives peppers a fun twist. Prepare the greens and vegetables ahead of time so it is ready to go for dinner. The dressing can be made and kept for several days in the refrigerator. Sweet potatoes paired with roasted red peppers is a great flavor combination. The avocado yogurt dressing provides a delicious alternative to mayonnaise. Serve at family get togethers, or take it to work for lunch. This is a powerhouse smoothie. A unique combination of the superfoods chia and ginger paired with the full flavor of rich tomatoes. Serve as a snack or as part of any meal. A simple dish to prepare, as the tomatoes are roasted together with the fish, eliminating multiple dishes. The avocado sauce flavored with lime juice provides a perfect complement. A gluten - free version of a traditional tabbouleh. Very delicious with plenty of parsley , tomatoes, red peppers and lemon juice. Make it up ahead of time and store it in the refrigerator. Take it to work for lunch, serve it at summer outdoor events or with your favorite entre. Baked, breaded eggplant is worth the effort. The combination of the crisp eggplant, sliced tomatoes and poached eggs make it the perfect breakfast. Eggplant can be breaded and baked the night before to save time. Savory muffins are a great addition to any meal or can be made and frozen ahead of time to be available as a quick snack. Aged cheddar cheese, red peppers, honey and fresh parsley combine to make a tasty treat. Stuffed peppers are a flavorful way to enjoy dinner while upping your fresh produce intake. Our sweet bell peppers pair with cheese, ground turkey, quinoa and zucchini for a hearty dish that’s perfect for holidays or family meals. Use any meat in lieu of ground turkey or go vegetarian by upping the quinoa, veggies and cheese. Take the classic nachos to the next level with Bell Pepper Nachos! Sweet bell peppers stand in for tortilla chips for a delicious, crowd-pleasing twist. Like ‘em hot? Add ¼ teaspoon red pepper flakes before baking. Serve with chopped Red Sun Farms tomatoes, guacamole and lowfat sour cream. This spin on the classic 7-layer dip is sure to be a hit with any crowd! Fresh cucumbers, sweet bell peppers and tomatoes combined with creamy feta are a tasty way to dip. Pizza: the perfect party, dinner, and snack food! These tasty creations use eggplant for the base in lieu of the traditional flour crust. Serve immediately to keep the juices and flavors locked in, and watch them disappear in a flash! This tomato tart combines the classic flavors of sweet tomatoes and salty cheese for a delicious and beautiful appetizer. It’s perfect for holidays, parties and special occasions. Use any of our greenhouse grown tomato varieties based on preference. Tomato-Mozzarella Skewers with Pesto are a delicious, simple and appetizer to serve any time of the year. Whether you’re looking for a healthy snack or a crowd-pleaser, this dish is sure to hit the spot with sweet tomatoes, salty cheese and savory pesto. Roasted Eggplant and Sweet Onion Dip is packed with flavor and nutrition. This dip makes for a great party appetizer, sandwich spread or healthy afternoon snack. Serve with warmed pita and plenty of fresh fruits and veggies for dipping, like cucumbers, cherry or grape tomatoes, and bell pepper scoops. Loaded with sweet Vidalia onions and bell peppers, this delicious baked breakfast or brunch dish can be assembled ahead of time, leaving just the baking for the morning. This Ham, Red Pepper and Mushroom Quiche is a colorful, flavorful dish to serve on Christmas morning or after Christmas to help use up leftover ham. Love stuffed peppers but not the work? This stuffed pepper soup is one way to get the flavor you love with a fraction of the effort. Warm up with a bowl of our delicious stuffed pepper soup. An American staple, the BLT can always to a refreshing choice especially on a hot summer day. The BLT is one of our favorites simply because it can be enjoyed the traditional way or with trendy, creative and delicious add-ins. Here's our version... let us know what you think. Turn the traditional salad into fun-to-eat lettuce wrap! Grilled Chicken Lettuce Wraps are bursting with flavor thanks to the Blueberry Bell Pepper Relish, plus they’re packed with antioxidants and A, B and C vitamins! Sometimes parents have to get creative in the ways to increase veggies with the family. This delicious chicken patty is packed with veggie goodness & complimented with colorful veggie spears. Who says we shouldn’t play with our food! Kabobs are a traditional summer staple, try them with pineapple and rosemary roasted vegetables for an explosion of flavors and textures. A true treat. A quick, simple and refreshing salad featuring fresh blueberries and crisp cucumber chunks with feta cheese, arugula and a lime vinaigrette. Sure peppers are a great addition to tacos, but what about using them as the Taco shell? Cut our famous bell peppers in half and there you have it a veggie shell! Here’s how we load our pepper shells. Pizza toppings are not just for pizza dough! Change it up and let your taste buds explore our delicious bell pepper pizza. Let your taste buds expand with this new take on sauce. That’s right, tomatoes are not the only vegetable that is perfect for a pasta sauce or as a coulis on your favorite protein. We love a good bell pepper sauce. Thanks to greenhouse-grown vegetables, such as tomatoes, bell peppers and cucumbers, you can enjoy garden-like freshness year-round. Chop these veggies and mix with cannellini (white beans) and almonds, mixed with vinaigrette, for a simple, delicious, and satisfying salad. Our Sweet Bell Pepper Pasta dish is easy to prepare and is a tasty way to enjoy the silky sweetness of Red Sun sweet bell peppers. We hope you enjoy it. Don't worry about making too much, we promise the leftovers are just as good. Add some flare to an otherwise plain baked potato. With avocado, black beans, tomatoes, peppers and corn these fiesta potatoes are sure to give your mouth a zing. Slow cookers seem to make the nights go smoother. Dinner is ready when you get home, which is great after a busy day. Veggie lasagna makes this night even better, packed with peppers, zucchini, spinach, mushrooms and we can’t forget about the cheese, it’s a fan favorite! Veggie Pasta is always a crowd pleaser. Maybe it’s the bow tie noodles that remind us of our childhood, or the creative, simplistic, way a variety of veggies are brought together in one dish; there always seems to be little left over at the end of a party. It will be impossible to look at Gnocchi the same after creating this effortless combination of flavors. Be sure to put this on the list of go-to dinner ideas. These gluten free delights are the perfect portion size, and packed full of flavor. Your muffin tin isn’t just for muffin’s anymore. The warm comfort meal for a winter’s day. Red, orange and yellow greenhouse grown bell peppers stuffed with garbanzo beans, kale, walnuts and brown rice make a delicious Mediterranean-influenced vegetarian dish. One Pot Wonders are all the rage, and for good reason! What’s easier than throwing everything into a pot (no need to cook the pasta!) and having dinner ready in 20 minutes with little to no work? This recipe for chicken lo mien will have you skipping on take-out and opting for a family-friendly, home-cooked meal instead. Tomato and Roasted Red Pepper Soup makes for a great first course for Christmas meals or a light dinner on Christmas Eve. Double the batch and freeze for an easy, produce-filled soup for busy nights to serve with baked grilled cheese. Thaw frozen Tomato & Roasted Red Pepper Soup in the refrigerator overnight and reheat when you need it. Colorful “Cowboy Caviar” is a flavorful and fun dip for backyard barbecues, picnics, casual lunches or snack time. If you are not a fan of cilantro, you can substitute it with flat leaf parsley. Once you taste Herbed Cucumber Bites, you’ll wonder how you did parties and get-togethers without them! Make double the goat cheese mixture to quickly make a second batch later in the week. Use any of our small tomato varieties based on preference. Bacon, cheese, tomato and avocado need we say more? Bacon and cheese on a bed of tomatoes with warm basil and avocados will feel like a lunch time treat or a dinner party extravagance. This is a veggie twist on a traditional Italian dish. What is better then eggplant and goat cheese? Stuffed eggplant with goat cheese, red pepper coulis and tempera artichoke hearts. A dish packed full of flavor and excitement. This chilled soup turns heads! With its use of tomatoes and cucumbers, and the clear broth the flavor is beautifully pronounced. Great for a summer luncheon or dinner party. Here is another play on flavors and textures that is sure to tantalize the senses. From grilled eggplant to a jam & mousse this dish won’t disappoint. Our savory Red Pepper Sorbet is a decadent palate cleanser. It is a whole new use for our signature peppers. Try it out! There is something about the heirloom tomato, and tart flavors that make it a culinary piece of art! This elegant combination are complimentary and taste beautiful. Chilled soups are great in the summer or as an on the go meal all year long! Our Tomato soup with sweet peas & corn is a comfort food; best served as a palate cleanse or at the start of a meal. Salad doesn’t always have to be eaten alone. Go against the grain, start your own trend, and top grilled flatbread with arugula salad, and a poached egg. Eat it as a pizza if you dare. Gazpacho is a southern dish that is great for summertime eats. Our yellow tomatoes color the soup like a sunny summer’s day. Come and enjoy this incredible cold soup. It’s Frittata time. Frittata’s are one meal that can be eaten at any time of the day. We love this chorizo with queso fresco, and roasted sweet bell peppers for dinner. We love mixing flavors and textures, and this recipe is no exception. We’ve got King Crab with tomatoes, cucumbers, sweet bell peppers, honey, lemon juice, dill and Greek yogurt. This dish is sure to appeal to your senses. Our heirloom tomatoes are beautiful on their own but in this tart they take tomatoes to a whole new level of culinary beauty. 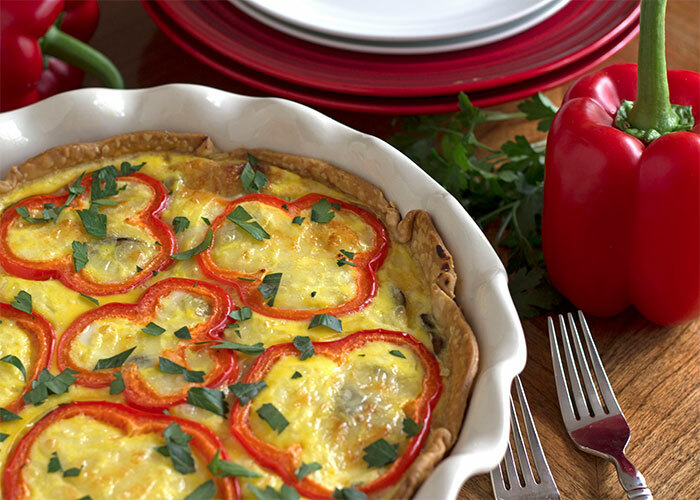 Paired with cheese, olive oil and parsley, this tart looks as good as it tastes! Jam doesn’t have to be made just from fruit. This yellow pepper jam proves that. Try a new take on jam with this sweet and savory flavor profile. This avocado pico de gallo is great for all occasions: parties, barbecues or simple snacking with tortilla chips. Pork Chops alone are a delicious treat add spicy tomatoes and mushrooms and you've got a meal that awakens the senses. This chicken cucumber tomato sandwich is light and refreshing, flavorful sandwich full of texture and summer goodness favorites. Enjoy yours today or at your next summer get together. Leave no crumbs behind with this Tomato Cheddar Bread with Avocado. Enjoy a delicious breakfast or breakfast for dinner with these savory Cheddar and Roasted Red Pepper Pancakes. Step up your stuffed pepper game, with this delicious bold dish. A warm hearty meal that is contained within a delicious Red Sun bell pepper. Try your hand at this sweet and spicy eggplant dish for a Thanksgiving side this year. It's a tangy, sweet, spicy, warm and aromatic dish that will make your mouth water and fill your house with a delicious fragrance as you prepare the rest of your Thanksgiving meal. A SUPER simple vegetarian dish, that is simple and perfect for the individual on the go! It also can be converted to make an appetizer.